You may be interested in a delicious Porridge. This product is healthy and very nutritious. You can get as much as 60% on selected products. You can go over our list of latest cheap Porridge deals and offerings brought to you by our community of bargain hunters. Whether you are looking for any kind of Porridge, you are sure to find something right within your budget. 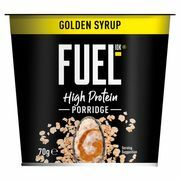 Choose among the different UK retailers including ASDA, Londis, Tesco, on where you can get the best Porridge deals and bargains. Get great value for your money. 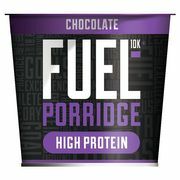 Cheapest price on all the best porridge brand in the UK! Porridge, or sometimes called porridge, porage and parritch, is a food which is commonly served in breakfasts. You can create this by boiling, crushing, grinding or chopping starchy plants. Usually, they are grains which can be mixed in water or milk. Most often, this is served or cooked with additional flavourings including fruit, syrup, honey or sugar. These are all necessary to make a sweet mixed cereal. Even vegetables and spices may be added too for a savoury dish. Just serve all of these hot! This will never fail as an instant meal that will let you go through the day. You can take it with sugar, salt, fruit, milk, cream or butter. There are also other flavourings that you can buy these days. There are even ready made oat porridge that you can purchase. Nevertheless, porridge has always been conventional. It has uses that many people find advantageous. For most traditions, it is a part of a culture. It is the most perfect food for the sick. Even in different trainings, athletes eat it. This is why it goes in varieties. Indeed, porridge will never run out of style. It will always be loved by many. 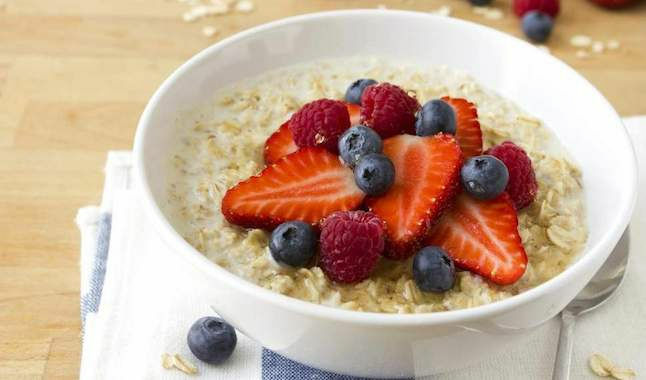 If you’re on a diet or simply want to live a healthy lifestyle, traditional porridge and porridge oats are a way to go. 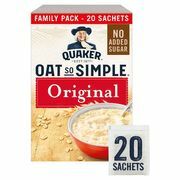 There are plenty of cheap porridge available online that will not hurt your weekly grocery budget, and with the help of Latest Deals, you are sure to save a lot on Scottish oats and oatmeal porridge from the best porridge brands in the UK. There are even porridge toppings that you can purchase at very low prices to create an energy-boosting breakfast. We have a massive community of bargain hunters who always share verified cheap Lucozade deals, discounts, and price drops from shops across the country. We also have a team of money-saving experts who regularly share essential shopping tips and tricks that can help you get some serious money off on your online and instore purchases. So if you’re looking for cheap Jamaican porridge, Scotts porridge oats, Quaker porridge oats, and even Quaker porridge sachets, you’ve come to the right place. Most UK online stores often have sale events, seasonal clearance, and flash sales where you can save as much as 50% off and more on a wide range of porridge brands and flavours. They usually reduce their prices further during Black Friday and Boxing Day. But if you want to maximise your savings, make sure to use the latest porridge discount codes you can search here. There are even voucher codes where you can get freebies and free shipping. Before finalising your order, you must ensure to check the expiration date first. Regardless, you can be assured that the UK retailers we feature here will only provide you will quality products. At a glance, porridge is considered to be one of the most exciting offerings for breakfast and it is true, all over the world. There is no denying that it has many benefits to your health.It is packed with micronutrients and fibre. Overall, it can fuel your energy. Low in calories. Porridge has the so-called richness of a stick to your ribs. Surprisingly, it only has a few numbers of calories. 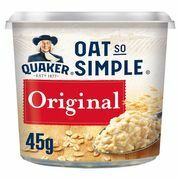 If you are going to eat a full cup of cooked oatmeal, you can be assured that you will consume 159 calories. In the end, you will also have slight fat and protein. This should not be bad at all. Fullness of fibre. One of the major health benefits of porridge is that it goes with a pretty good content of fibre. This component is crucial in making your meals even more satisfying. In the end, it would also help you fill your stomach without having to add more calories. If you want to fight constipation so that your digestion is kept regular, you should also seek this perk from porridge. Filled with Nutrients. There is a wealth of health benefits waiting for you from porridge, one of which is the nutrients it can offer. For instance, it has the fortified porridge which comes with a number of added calcium and phosphorus. These can benefit the health of your bones. Furthermore, there is also iron. This helps in supporting your metabolism to nourish your red blood cells eventually. Enjoy B-complex vitamins too that can make you produce energy. Appropriate to your diet. If you are one of those people who fail with your diet from time to time, going for a porridge should help you solve this. Usually, oats would absorb flavours of other ingredients that you cook it with. So pick from sweet or savoury flavourings if you must to create new combinations. Looking for how to make the perfect porridge? Then follow Jamie's own recipe for the ultimate breakfast winter warmer. Twist it up with his different toppings & flavours and you'll never get bored of this classic dish to start your day. Congee. This is an Asian porridge. This is a plain rice congee that is usually eaten with a side dish. There are other ingredients added to the preparation. Among them are flavourings, fish and meat. Eventually, this can be the main course. Bubur Hitam. Bubur Ketan Hitam is a dessert from black glutinous rice porridge which is combined with coconut milk and cane sugar or palm sugar. This is commonly found in Malaysia and Indonesia. Frumenty. Frumenty was a porridge from cracked meat. This is popular in Western Europe in medieval times. You can eat it with eggs, milk or broth. Among the sweet variants were currants, almonds, sugar, orange flower water and saffron. Gruel. Gruel is a thinner version of porridge. This is composed of cereal such as wheat, oat, rice or rye flour. This can be boiled in milk or water. As a matter of fact, you can serve it even sans cooking. That is its magic which you might want to try. Hasty pudding. Hasty pudding is a porridge that features grains in water or milk. It is made of wheat flour if you are to buy it from Britain, while corn if in the United States. That is how you can distinguish the two. Oatmeal. Oatmeal is a porridge that originates from oats. You can eat it as a meal or you can use it as a material for other meals including oatcakes. Be creative with this oatmeal and you will enjoy it for sure. Sadza. Sadza is a cornmeal. It is typical in southern and eastern Africa, most especially in Zimbabwe. You can make one with white maize which you can eat from a communal bowl. You can decide to serve it in separate plates too. That should work as well.